We might now be witnessing the first truly tuned Tesla Model S after Jason Hughes managed to modified his Model S P85 to get about 30% more power out of it. At this point, Hughes has a lot of creds in the Tesla owners community. The guy has uncovered tons of interesting tidbits of information through his tinkering with his own Tesla vehicles and the ones that he purchased through salvage auctions for his other projects, like his massive home energy storage system. He also managed to unlock more power through hacking the Ludicrous mode software onto the vehicle. Tesla introduced the Ludicrous mode only after the automaker’s “performance vehicles” were all equipped with dual motors. So in order to take advantage of the higher power output of the battery pack equipped with the Ludicrous upgrade, Hughes had to the trick the car into thinking that it has a second motor. That’s basically a fake front-wheel motor. With it, Hughes was able to run a Model S P85D Ludicrous software on his P85. It achieved 508 hp – significantly more than the stock version’s 416 hp. He later played musical chair with his battery packs after he got his hands a 100 kWh pack and he ended up upgrading the P85, which had just become a ‘P85++’, with a 90 kWh pack – turning it into a ‘P90++’. 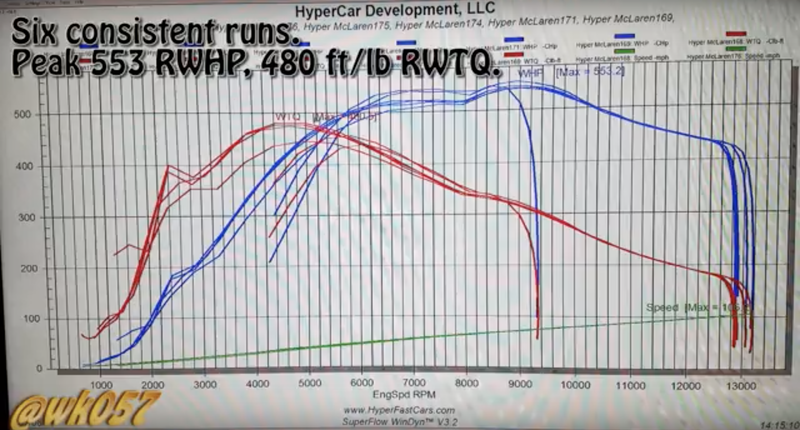 553 RWHP and 480 ft/lbs RWTQ is about a 30% improvement on the stock version of the vehicle and the first evidence of performance tuning the Tesla Model S.
Several Tesla owners expressed interest in getting the same upgrades to their car, whether it be just the fake front motor with the software upgrade or the full package with the ludicrous battery pack. Are we witnessing the birth of a new Tesla tuning business?